When Argentinian cartoonist José Muñoz received this year’s Grand Prix at the comics festival in Angoulême, he stated that he considered it as much a recognition of his friend, countryman and collaborator Carlos Sampayo, as of himself. It would indeed be hard to imagine one without the other. 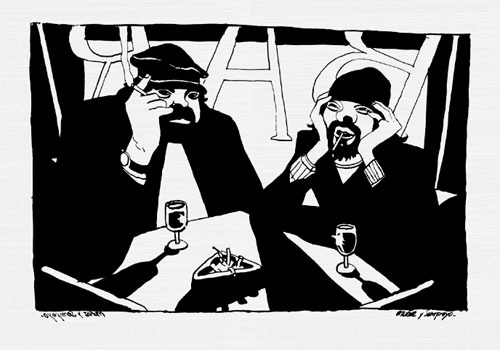 Though they have both worked independently of each other, in comics as well as other media, it is in the comics they have created together one finds the soul of their art, an art carried by a clear authorial voice and a stark but ultimately strongly humanist sensibility. The best of their work rates amongst the finest explorations of human emotion and behaviour in comics. This interview was conducted by myself and my compadre T. Thorhauge back in the late summer of 2001 at the Berliner ComicFestival. They were invited as guests of the festival at a time when they had just started working together again, after a long hiatus due to Sampayo having been seriously ill for a number of years. Sampayo, who mostly spoke Spanish and Italian, participated actively, but since neither of us were proficient in those languages at the time, a lot of what he said was filtered through Muñoz. This somehow seemed fitting enough, given the obvious closeness of their friendship, so consider much of this as their joint thoughts on the issues discussed. Unfortunately, the interview has languished in the Rackham archives for years because we wanted to publish it, but never found a good occasion to do so. With the honor accorded to Muñoz & Sampayo at this year’s Angoulême festival, we finally have. We hope our tardiness will be forgiven by the participants who so graciously gave us their time back then. Wivel: How did you meet? Muñoz: We’re both from Buenos Aires, but met in Spain in ‘74. We’re economical refugees from the Argentinian dictatorship. When we met, I was already working in comics while Carlos was in the advertising business. Wivel: And you quickly decided to work together on a comic? Muñoz: Yes, we immediately began doing what we wanted to do – a crime series [Alack Sinner]. Another reason we did it was because the publisher’s at the time were less likely to put out something that didn’t fit into one of the established genres. But the series quickly changed in character and became increasingly concerned with telling the stories of individuals. This meant that the readership waned as the quality rose. Thorhauge: Concerning Alack Sinner and the crime genre, I’d like to ask you about your obvious interest in American culture. Muñoz: We’re very fascinated with American culture – it’s our culture, we’re Americans. Thorhauge: But from South America. Muñoz: Yes, but that’s also America. USA is a nation without a name and has therefore appropriated ’America’ as its own. It’s all America – it doesn’t make sense to talk about North, Central and South America. Thorhauge: I was mostly thinking of the culture of the US – jazz, etc. Muñoz: Yes, jazz has always been an important part of our lives – Carlos is also a jazz critic. Thorhauge: It must have been a considerable challenge to translate music into pictures, as you did in Billie Holiday. Muñoz: In order to understand it, you need to understand Billie Holiday’s music. Wivel: Argentina and its development is central to your work – has it been a conscious ambition of yours to comment on the situation in your homeland? Muñoz: With Sudor Sudaca we started to focus more directly on our homeland. But it isn’t a conscious choice, there’s no particular strategy behind it. We’re steet kids from Buenos Aires and tell stories about important aspects of our lives. Wivel: Yes, it doesn’t seem like you’re overtly political in your description and criticism of society. If one for example makes the comparison with Carlos Gimenez’ political comics about the Franco regime on Spain, your comics seem considerably more interested in conveying aspects of society through the stories of individual characters who you describe in depth. Muñoz: Yes, that’s true. You’ve got to remember that Carlos is a member of the Spanish Communist Party and in that sense has a completely different sense of belonging and responsibility than us. Our only responsibility is ourselves, our party is our conscience. Wivel: As already mentioned, your comics quickly developed in the direction of more personal stories. Something that’s rather unique, especially considering the time you started out doing it. Muñoz: We’ve never tried to be original or avant-garde, and there are no ulterior motives to our work. Our point of departure is our friendship. It is the one and all of our work. Wivel: How does your collaboration work? Muñoz: We talk all the time. We talk about everything that interests us, and that’s where the stories come from. It is always – or at least in our case – rather contrived to seperate the ’writer’ and the ’artist’ of the comics. It’s of course my responsibility to draw them while Carlos writes the words, but the story itself is a product of our collaboration. It usually starts out with us discussing the story, then I start drawing it and sending the pages off to Carlos who works them over and sends them back. Thorhauge: How often do you meet? Muñoz: Back when we started, we were both living in Barcelona, but after a few years I moved to Milan, which of course meant we started seeing less of each other – we’d meet perhaps every three months or so. In later years, it has varied somewhat – sometimes six months pass without us seeing each other, but we stay in touch over the phone. During the 90s, Carlos was very ill and we had to put our work on hold, but now that he’s over it we’ve started again. Wivel: I’d like to ask about your drawing style and the development in your approach. 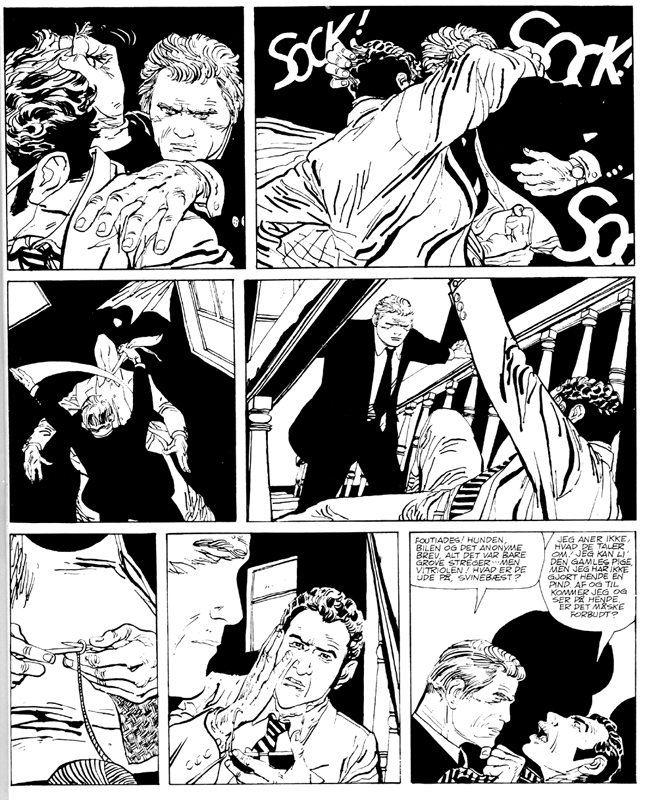 The first Alack Sinner stories seem influenced by the classic American black-and-white adventure style, for example as seen in Milton Caniff. 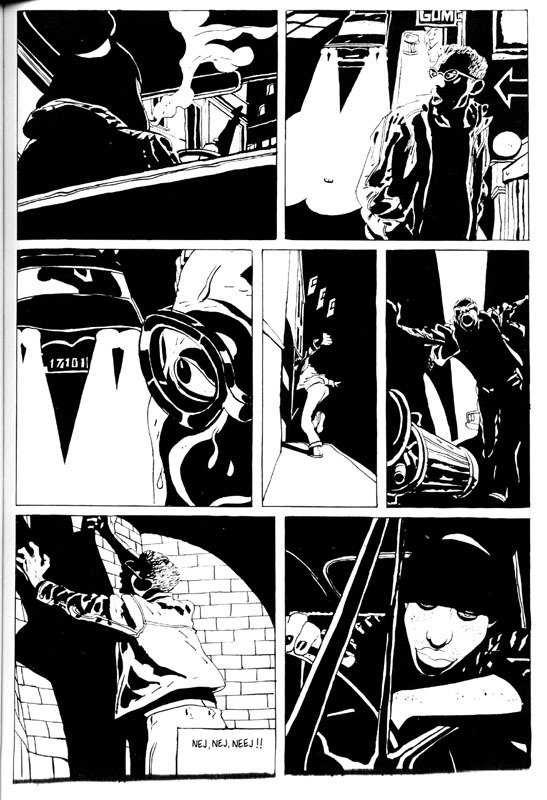 Muñoz: There is this established style of drawing that goes back to Caniff, but for us it was primarily the Argentinian comics of our childhood and youth which influenced our approach to comics. 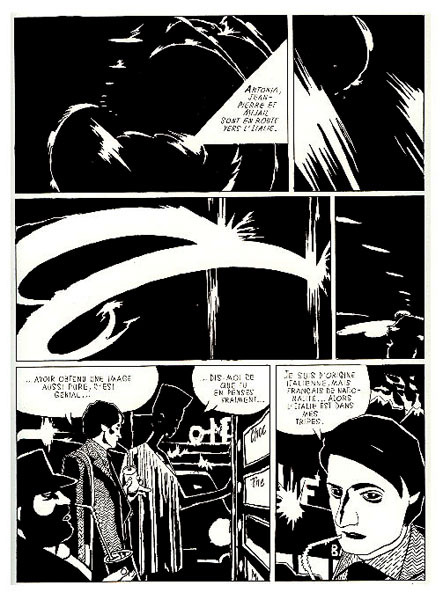 The black-and-white school, supremely represented by Alberto Breccia and Hugo Pratt, who lived and worked in Argentina for a number of years. Also, the comics writer Hector Oesterheld, who was killed along with his family by the regime, has been a strong influence. Wivel: You quickly evolved towards a more expressive, raw style. Muñoz: Yes, that’s part of my development of black and white. To me, it’s about feeling things around me. If I am to draw a table, a glass or a person, I have to feel them. This feeling is translated through the hand when it is drawing and the line starts curving and coming alive. Wivel: Comics have often employed expressive idioms – you can do certain things in comics that appear less natural in other media, you can for example juxtapose a realistically drawn character with a strongly caricatured one. Are comics better suited to this kind of exageration than to express more subtle, nuanced things? 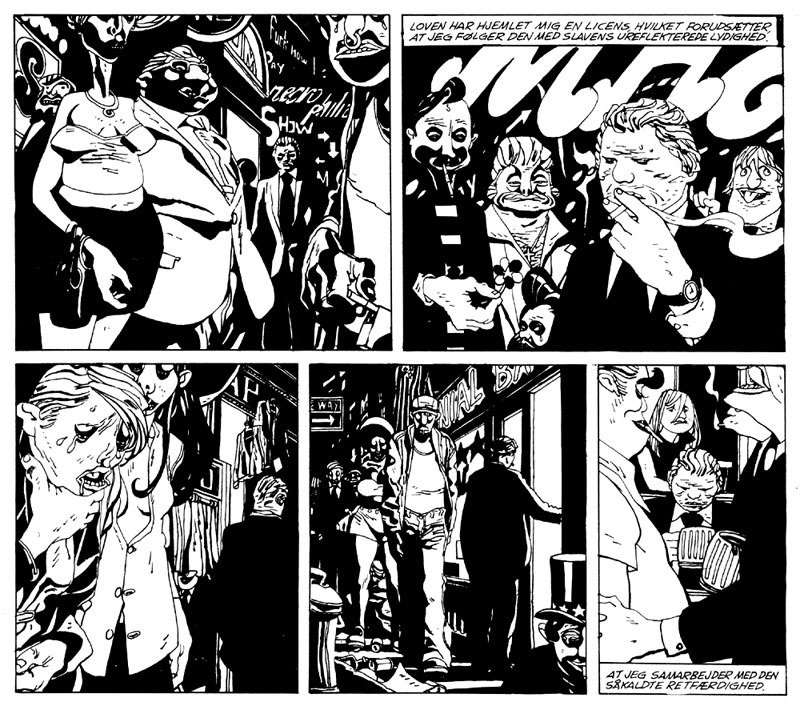 Muñoz: I don’t think so, it’s just the way I work – there are many styles that work well in comics: realism, ligne claire, etc. Wivel: The most recent of yours works that I’ve seen, Le Poète, is drawn in more of a line-oriented style – there are fewer, large areas of solid black and the linework is finer and to a large extent what constitutes the figures. Muñoz: That’s true. That story is kind of a special case because I had to describe the place I live [Milan] for the first time. It was important to me to convey the distincness of the place, to feel it, which is what mae the linework sharper and clearer than usual. It’s kind of a Muñoz-version of ligne claire. Wivel: So it doesn’t reflect a general tendency in your work, but rather an adaptation to that specific album’s needs? Wivel: While we’re at the subject of your style, I’d like to ask you about influences from outside comics, from the fine arts, for example. Muñoz: That’s of course something I look at. I’m deeply fascinated with the Italian Renaissance and spend a lot of time looking at drawings from that period. I’m also fascinated by Nordic expressionism of the 20th Century – Germany, and so on. You’re from Denmark, right? Muñoz: Isn’t that where Munch is from? Muñoz: That’s right, sometimes it can be a little difficult distinguishing your countries from each other. Wivel: It’s only natural – we’re a rather homogenous group, we share our cultural and linguistic background. Do you work with drawing in other areas besides comics? Muñoz: Yes, I also do a fair amount of illustration and I work with a sort of painting. Also, I do smaller works in ink and watercolour, but just for my own enjoyment. Wivel: Why don’t you work in colour in your comics? Muñoz: I would actually like to, and I already have done one story recently, but the black-and-white style has so much potential and offers so many possibilities that I’m sticking to exploring it. I think I could spend four lives working in black and white. Wivel: [to Sampayo] What about you? I understand that you’re both a critic and a writer, and that you write as much straight prose as you do comics. What’s the difference between the two? Sampayo: The difference, naturally, is that you don’t use language in the same way in comics. You don’t need to describe all the things taken care of in the drawing. You have to think in images. Muñoz: We often use symbolic imagery. To us, the fantastic is part of reality. That this glass exists is fantastic, that this table exists is fantastic, that a person exists is fantastic. Life is fantastic. Wivel: What I think I’m asking about is whether this also has something to do with your cultural background. From your part of the world, we for example have magical realism in literature. Sampayo: ’Magical realism’ is the invention of European publishers in order to market a number of completely different authors under a common designation. Actually, authors the world over work within shifting boundaries of the concrete and the magical – Gabriel Garcia Marquéz does it, but so does Kafka and Lovecraft. I don’t mean to suggest that there’s nothing culturally specific to the work of the so-called ’magical realists.’ Alejo Carpentier from Cuba, for example, has that whole Caribbean mixture of catholicism and African-derived religion – voodoo, etc. – under his skin. In Argentina we’re further removed from that, but African music and dance is also somehow foundational to tango. Magic is, at base, about how you see the world. Muñoz: We are not magic, we are real! Wivel: How do you look upon your own development from back when you started in the 70s till today? Muñoz: We’re both approaching 60 and have thus reached the final phase of our lives. We’re no longer as idealistic and experimental, but have probably become more profound. The optimism we had regarding the possibilities of bettering conditions in our homeland, as well as the world in general, has probably waned. I’ve lost my belief in socialism as a way out and have become more of a doubter. We’ve probably become more pessimistic, but that doesn’t mean we’ve given up. In spite of all the horrors, life is an adventure – living is magical. Perhaps life is like a comic. The story is in our hands, and we must all work on creating a better script, a better story. 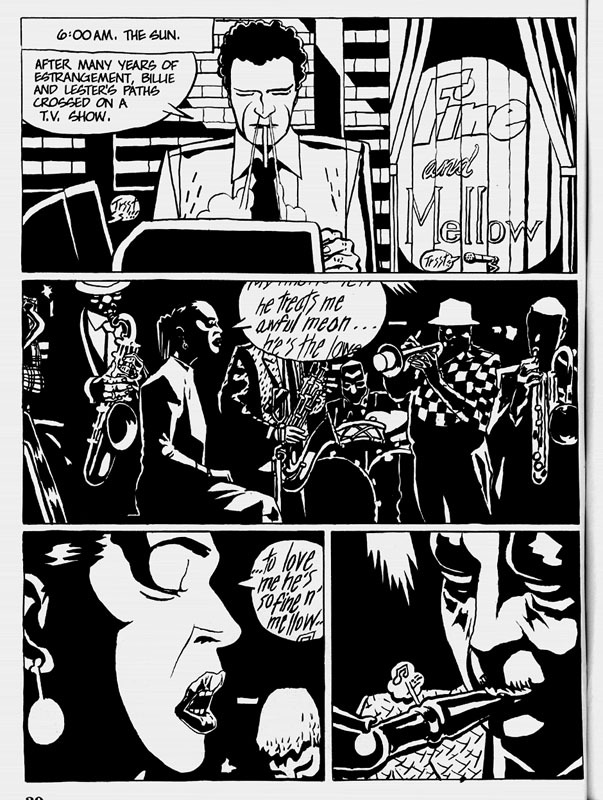 The images show a self-portrait of the duo, a panel from their recent book Le Livre (read Rackham‘s review here), a page from the first Alack Sinner, a page from Billie Holiday, a page from one of the Joe’s Bar stories, a page from Jeu de lumière, a page from Alack Sinner, and a panel from Joe’s Bar. There is currently an exhibition of Muñoz & Sampayo’s work in Leuven. For more information on the artists, check Paul Gravett’s presentation/bibliography and Oscar Zarate’s appreciation of their work here.